One of the joys of portrait photography is how dramatically you can change the look and feel of an image with just a simple adjustment to your lighting. If you're working outside, for example, you might choose to use ambient light on its own or a flashgun for more balance, or you may want to bounce natural or artificial light from a reflector to help fill in shadows. Indoors, however, when you have complete control over all the lighting in the scene, you can push your creativity much further. When you consider just how many different types of lights, accessories and backgrounds there are, you start to realise that the possibilities are endless. 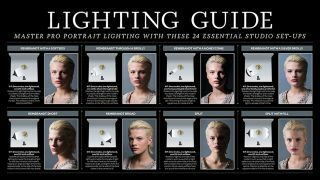 Do you use one light or several? Where should these be in relation to your subject? Should they be modified with an accessory of some sort or simply used as they are? And should you light your background too? Fortunately, there are a range of tried-and-tested styles that you can adopt quite simply. Even if you only have a single studio light and an accessory such as a softbox or brolly, you can get cracking with some simple Rembrandt-style lighting, which is characterised by one side of the face being lit well and the other side more in shadow. Add another light to the mix, and perhaps another accessory too, and you can try a few further styles. You can opt for virtually shadow-free results by positioning the lights in specific positions, or you can light the background to make your subject stand out differently against it. You may even want to throw in a few coloured gels to create something unconventional. Click the top-right-hand corner of the sheet below to get it in high resolution –and make sure to bookmark us and check back for more great cheat sheets!